The most distinctive feature of Georgian folk song is that it is polyphonic in its original folk context. Scholars believe Georgian folk song has been polyphonic for many centuries, perhaps even for a millennium or more. The vast majority of these songs are in three voice parts. Georgians are proud of their traditional polyphony, designated by UNESCO as a Masterpiece of Oral and Intangible Heritage of Humanity. Georgian polyphony takes a wide variety of forms and regional varieties. Some songs use ornamented upper parts over a drone bass (e. g. Ts’int’sqaro): these songs are most prevalent in the eastern part of the country. Some polyphony is completely independent, with the three parts singing different melody, rhythm and text at the same time (e. g. Perad shindi): these are typical of the region of Guria in western Georgia. Other songs are homophonic, with text in all three parts generally moving at the same time (e. g. Mok’le shemodzakhili). 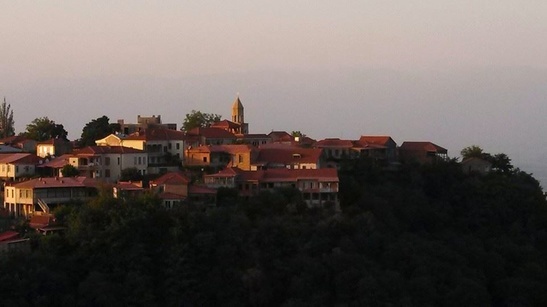 The homophonic approach is generally used in Georgian Orthodox liturgical music, a very rich and long-standing musical tradition now being revitalized in churches across Georgia. Like folk songs from the rest of the world, Georgian songs are traditionally connected with events of daily life. There are work songs, laments, lullabies, songs about historical events or figures, ritual songs, healing songs, traveling songs, comic and dance songs. Table songs are a particularly important genre, with the tradition of the supra (feast) with an elaborate series of toasts and songs occupying a central position in Georgian traditional culture. Near the turn of the 20th century, Georgian folk songs began to attract the attention of the wider musical community, through early wax and gramophone recordings, then through ensembles that presented this repertoire on the concert stage. Soviet-era emphasis on folk music as evidence of the power of native peoples brought a number of changes, as performance by large choirs and folk instrument ensembles was promoted, and content of song lyrics was altered to fit socialist ideology. Today, folk performance ensembles in Georgia rarely number more than 15 voices. Many of the best-known ensembles are male voice groups, such as the Rustavi Choir. 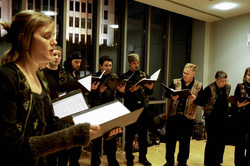 Mixed-voice ensembles often include members of families, in which many of these songs were handed down through the generations. There are women’s ensembles as well, often performing music traditionally associated with women. The distribution of singers on the various voice parts has been done in different ways by Georgian ensembles. Often, there is just one singer on each of the top two parts, with all other singers on the bass or bani part. Even when this practice is not followed, the number of singers on the bottom part is usually the largest, and the Western choral concept of numerical voice-part balance is not applicable to Georgian folk music. Ensemble Alioni visited the Republic of Georgia!